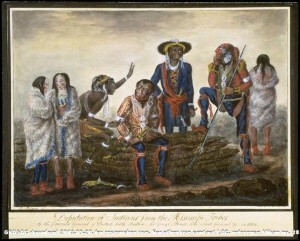 This post is the second part of a series of essays by Alan Corbiere focusing on Anishinaabeg participation in the War of 1812. This is the second in a series of posts that explore this question. Last month I examined Michilimackinac’s importance for Anishinaabe peoples. Today’s post addresses British policy as explained to the Anishinaabeg in Council. Next month, in the final installment in the series, I will focus on Anishinaabe reactions to the news that Great Britain and USA had entered into a peace treaty. Alan Corbiere is Anishinaabemowin Revival Program Coordinator at Lakeview School, M’Chigeeng First Nation. Chalou, George C. 1971. “The Red Pawns Go to War: British- American Indian Relations, 1810- 1815.” p. 139. Great post, thanks Alan. I look forward to the next one.